Looking for something to read? 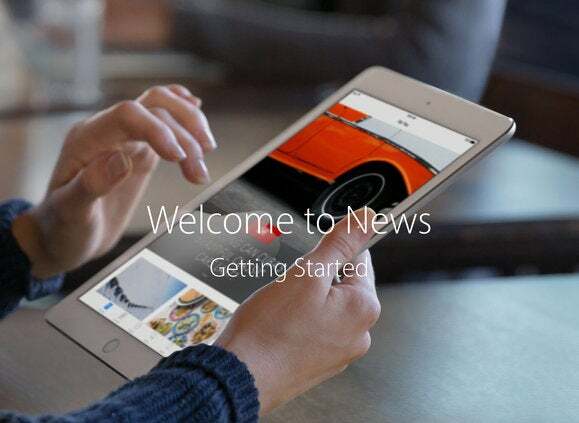 Apple is now delivering your daily news. 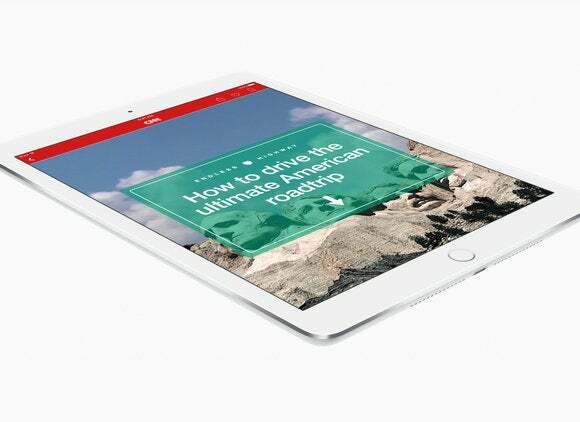 Like Facebook and Snapchat, Apple has partnered with news publishers to deliver a beautiful and fast-loading editorial experience on its home turf: iOS devices. 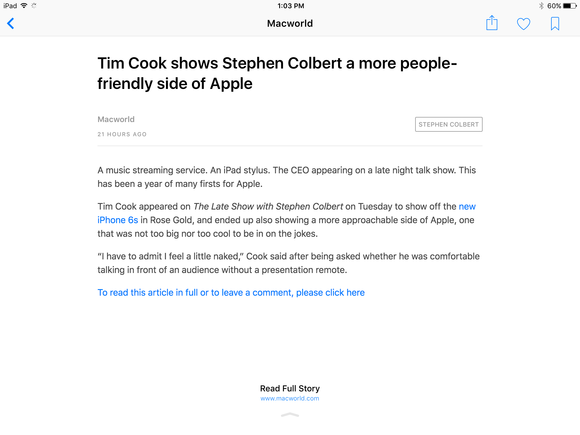 Apple News is a brand-new native app that officially launched with iOS 9 and replaces Newsstand. 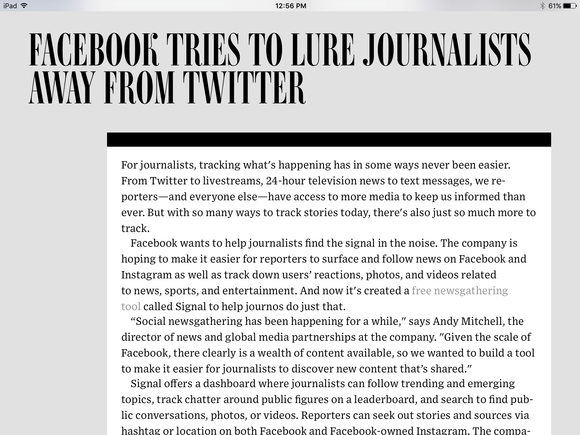 Similar to Flipboard, News uses RSS feeds to pull together stories from different publishers in a magazine-style layout. News, however, doesn’t have Flipboard’s built-in social capabilities, like incorporating a feed of just links shared by your Twitter network. Previously, iOS devices had a Newsstand folder that served as a hub for newspaper and magazine apps. Newsstand is gone in iOS 9—while all of your Newsstand apps are still there, and any newspaper or magazine subscriptions remain active, the apps are placed in a regular (read: deleteable) folder instead. 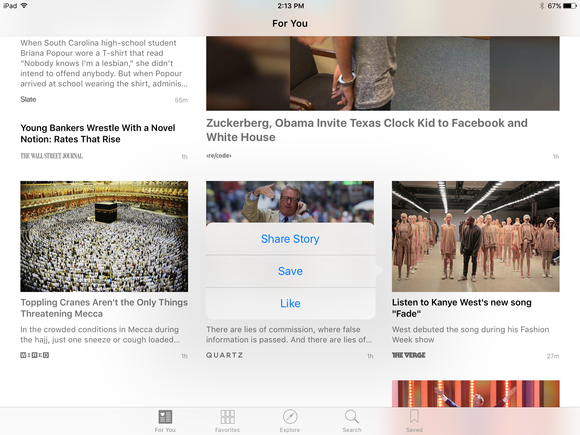 Here’s how to get started with Apple News after upgrading to iOS 9. Open the News app and you’ll be greeted with a welcome screen and link to read a disclaimer about your privacy. (Apple News collects your information only to enhance your reading suggestions within the app, and Apple “understands that the articles you read are personal,” so your reading activity is not linked to other Apple services). After you click “Get Started,” you will be asked to choose at least one channel (publisher) or topic to continue. We suggest selecting at least five to get a variety of articles and content. The channels that shot up near the top (CNN, The New York Times, BuzzFeed, etc.) were from publications that have signed up for Apple News Format, meaning their stories will have a custom layout and design. Keep scrolling down to find more channels and topics. Topics tend to go from very general, like “Politics” and “Sports,” to highly specific, like the “Presidency of Bill Clinton” and just “Max Blumenthal,” so we’re certain you’ll be able to find something of interest. You can edit or add more channels and topics later on, so don’t freak out if you forget to add a favorite at the start. After you select your favorites, you’ll find a sign-up option to “Get News in Your Inbox.” We signed up for this when iOS 9 launched on Wednesday, but we haven’t received a News digest yet, so it must not be a daily newsletter. News instantly generates a customized magazine using all the sources you selected, and you’ll find this by tapping on the “For You” tab. You will see stories from The Wall Street Journal and Cosmo, side by side and updated chronologically whenever one of your favorite channels posts a new article. 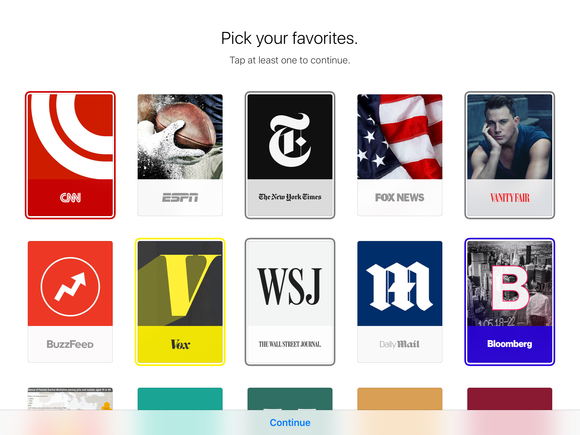 Similar to how it works in Apple Music, the For You section in News “learns” from your preferences. “Like” a story on the homepage or on by pressing the heart icon on the article page and News will know to surface similar suggestions. For You also sporadically shows a row of topics “you might like,” but these suggestions—Business, Politics, Entertainment, and Sports—didn’t seem specifically tailored to me. In addition to For You, the News app has four other tabs on the bottom of the screen: Favorites, Explore, Search, and Saved. Lastly, Saved is akin to the Reading List in Safari, a place where you can store all the articles you wish to read later. It also includes a History tab, which you can clear if you ever spend too much time reading US Weekly. Apple claims to have recruited 50 publishers to be launch partners for News, including Wired, CNN, The New York Times, The Atlantic, ESPN, and Slate. These publishers worked directly with Apple to format a few feature stories in what Cupertino is calling “Apple News Format.” You can read full articles from all these publishing partners on Apple News, without ever visiting their own websites. This new eye-popping format incorporates large images, video, slideshows, pop-up text, and other multimedia features. Apple News Format also has its own tagging and category system to surface similar reads once you reach the end of an article. You can get a sense for how each publisher has played around with Apple News Format in the Apple News Updates channel (previously Apple News Selections), available in your Favorites tab. For example, Wired’s recent cover story with actress Rashida Jones is full of bells and whistles (slide-in text, video embed, etc.). Not every story from an Apple News partner is as eye-popping, however. The rest of Wired’s stories follow a template. It’s still custom to Wired—using the magazine’s logo, font and iconography—but it’s not as dynamic as its Rashida Jones “enhanced” cover story. Not every story from an Apple News partner is “enhanced” with multimedia bells and whistles. If you’re reading a story from a publisher that has not partnered with Apple News, then the experience is more bare bones, very similar to any other RSS reader—you’ll find the story’s headline with a main image and a two-sentence description before it prompts you to read the rest of the article via a link to the publisher’s website. Swipe up, and you’re instantly taken to the publisher’s website to read the entire article. Thankfully, most full articles load surprisingly fast, since they load right in the News app, instead of taking you out of the app and launching in Safari. Even though Apple is using its iAd platform to sell ads on News, we didn’t spot any advertisements at all. Publishers can bring their own ad partners and keep 100 percent of the revenue, too. It’s been reported that several publishers like GQ have nabbed sponsorships just for Apple News content.